Paulette Bethel, a Bahamian national, is the Special Advisor-Multilateral Affairs on the Emerging Ag Team. She is a seasoned diplomat and manager with a wide range of national, regional and international experiences in areas related to sustainable development, among others. Before joining Emerging Ag, Paulette served as Special Advisor-Coordination and Engagement in the Office of the President of the 70th Session of the United Nations General Assembly (UNGA). Two years prior to that, she had served as Chef de Cabinet in the Office of the President of the 68th Session of the UNGA. Her career in the international arena began when she was employed by the United Nations in Vienna, Austria, after which she joined the Ministry of Foreign Affairs of the Commonwealth of The Bahamas, where she served as a senior diplomat for a number of years. 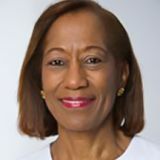 Paulette's work in the international arena included the post of Director of the Department of Fellowships at the Organization of American States (OAS), becoming the first Bahamian national to hold a senior-level position in that Organization. She returned to The Bahamas for a period of time, during which she she was employed in the private sector in the area of international financial and corporate services, dealing with risk management and compliance matters. In 2003, Paulette was appointed as Ambassador Extraordinary and Plenipotentiary of The Bahamas to the United Nations, becoming her country’s first female Ambassador to the UN. She held that post for ten years up to March, 2013. Paulette received her Ph.D. in Sociology from the University of Massachusetts at Amherst and obtained her Master of Arts (MA) and Bachelor of Arts (BA) degrees from Howard University and the University of Toronto, respectively. She also holds a number of certificates, including one in Creative Processes Facilitation and one in International Negotiations. Based on a Memorandum of Understanding (MoU) between the United Nations Institute for Training and Research (UNITAR) and Emerging ag, a training seminar will be presented at UN Headquarters in New York, on 6 March, 2018, to raise awareness of the pivotal role played by agriculture as a sector and by farmers, especially women farmers, to achieve sustainable development. The upcoming 62nd Session of the Commission on the Status of Women (CSW 62) and its focus on rural women makes this initiative most timely and relevant to ongoing efforts to achieve the SDGs, and in particular Goal 2 and Goal 5, highlighting the fact that sustainable agriculture and farmers must be central to policy decisions that affect food security and nutrition. An international award for developing a form of livestock insurance has been awarded to a Cornell development economist and his partners in the USAID-funded BASIS Assets and Market Access Innovation Lab. The insurance could help hundreds of thousands of African herders stave off poverty in times of drought. Index based insurance aids pastoralists affected by drought by giving them the resources to buy feed and needed supplies before they acquire losses in both wealth and productive assets. The United States Agency for International Development’s (USAID) Board for International Food and Agricultural Development (BIFAD) has given its 2016 Award for Scientific Excellence to Chris Barrett, the Stephen B. and Janice G. Ashley Professor of Applied Economics and Management at the Charles H. Dyson School of Applied Economics and Management; Andrew Mude, PhD 2006, principal economist at the International Livestock Research Institute (ILRI); and Michael Carter, professor of agricultural and resource economics at the University of California, Davis (UC Davis). The award was presented 12 Oct 2016 at the 2016 World Food Prize international symposium in Des Moines, Iowa. We are proud to work with ILRI to increase awareness of the vital role livestock plays in agriculture and its contribution to the Sustainable Development Goals.